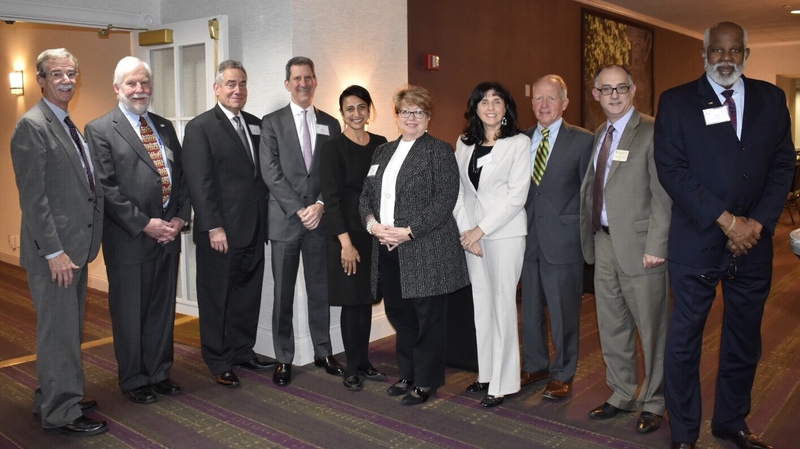 Several Maryland Access to Justice Commissioners, including Maryland Attorney General Brian Frosh, Delegate Kathleen Dumais, and the Deans of both of the state’s law schools, joined the MSBA Board of Governors for its monthly meeting held November 20, 2018, at the Hilton Washington, D.C./Rockville Hotel and Executive Meeting Center in Rockville, Maryland. Members from both organizations mingled to discuss the recently established collaboration between the Maryland Access to Justice Commission (A2JC) and the MSBA to further their collaborative mission to make the civil justice system more accessible, user-friendly, and fair for all Marylanders. The A2JC is also “thrilled” with the recent addition of three new MSBA Commissioners to its ranks, including Hon. Hope Tipton, Young Lawyers Section Chair Indira Sharma, and President-Elect Dana Williams, noted Coe. “I think it’s a noble effort, and I congratulate you and commend you for engaging in it,” he said. A2JC is an independent entity that unites high-level leaders to drive innovations and reforms in the civil justice system to ensure it is accessible, user-friendly, and fair for all Marylanders. The A2JC’s efforts are spearheaded by approximately 20 prominent leaders from different segments of the legal profession, including the Deans of both the University of Maryland Francis King Carey School of Law and the University of Baltimore School of Law; the Maryland Attorney General; law firm partners; corporate counsel; legislators; leaders of legal services organizations; academics; funders; and representatives from the Maryland Judiciary and the MSBA. State-level access to justice commissions (there are now 40) have proliferated over the last decade to address the national void in access to civil legal aid. However, even the state of Maryland falls short of meeting the demand for civil legal services. Over 325,000 low- and middle-income Marylanders do not receive the civil legal aid they require. There is no comprehensive right to an appointed attorney in civil cases, where housing, wages, freedom from abuse, access to public benefits, child custody, or deportation may be at issue, while the presence of a lawyer continues to be the key determinant in the success of such cases. The consequences of not receiving the legal help needed ripple out beyond the impacted individual and their family. The lack of access to justice destabilizes communities, decreases business productivity, causes court delays, and ultimately costs taxpayers more money on the back end. To address these challenges, the A2JC works to study the civil legal aid system, develop a statewide vision and plan to fill this void, and recommend improvements while also pursuing specific initiatives focused on areas of especially great need, such as immigration and eviction.